Let’s talk about Clocks! I am OBSESSED with large clocks and couldn’t WAIT to share this blog post with you. And while every home suits a small clock here and there, not every home suits a large clock, which can look out of place and awkward if not hung in the right spot. When my E-design client was looking for the perfect paint colour for her dining room, it was Agreeable Gray that set the perfect tone for this GORGEOUS large clock display! I love the rustic wood backdrop of that clock and how it picks up on the stain of the buffet top. If you picture the space without the clock, you’ll see a focal point that is at half of its potential. The soft contrast of the clock colour sits perfectly on the rustic wood and picks up on the lighter tones in the furnishings without being ‘punchy’. This covers a whole range of walls including entryways, bare walls, bedroom walls and more! The dining room. A large clock in a dining room is a nice alternative to a traditional buffet and hutch. In the bedroom: If your headboard is low enough, consider a large clock as a way to keep track of quality ‘time’ in the bedroom! 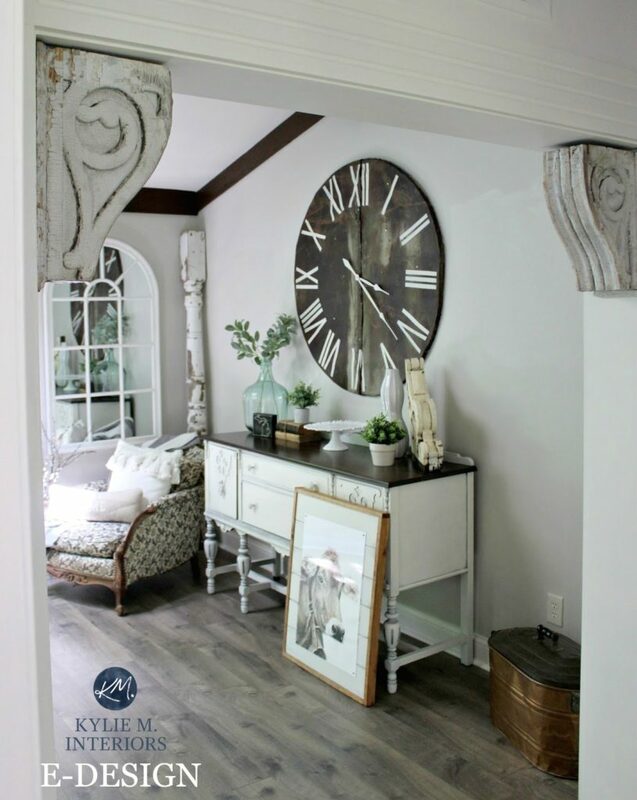 The entryway: With a console or sofa style table, an oversized clock can be a great way to add style to an entryway. Check out this gorgeous farmhouse country entryway! Click HERE to see info on the above clocks. Well, I hope you found this article on large clocks as stimulating as I did! For your own custom-tailored Design, check out my Online Decorating and Color Consulting Services! This post contains affiliate links, meaning that I make a small portion from every sale. This does not cost you any more money, just allows me a small income from these sales! I have always had a mad love for clocks – any size will do…but the larger the better! Umm, yes, I can see now how this could get dangerous 😉 I have always been envious of your fabulous clock in your entryway. It is the absolute perfect spot for it. Great post! I love all those clocks! So many great ideas on where they can go! Thank you for sharing. So I just purchased a very large circular Howard Miller clock, and it is the first thing you see when you enter my home, through the front door. However, I have also found a rectanglar clock that I would like to hang on the wall next to the front door, so it would be the last thing you see as you leave my house. I love clocks too. Can you have too many?? Hi Sheri, you can definitely have too many! Unless you have a ‘collection’, but that’s a different thing. I don’t think I would hang them so close together. Too much of a good thing can really cancel out the beautiful effect that 1 good piece can have! Those clocks and the settings are stunning! Who doesn’t love a BIG clock? Great blog. this is great info. I have not one decorative bone in my body so I always turn to the internet for decorating ideas. I already have a fireplace that is in th ecorner of the room. I want a large farmhouse clock for this room. Should I get one that matches my décor or one that matches my brick fireplace? Hi Linda, I would definitely lean toward one that goes along with the decor as long as it’s not SHOCKINGLY different from your fireplace! Kylie – I’m looking at a 45 inch clock above my sofa. Would placement still be 8 inches above the sofa for vaulted ceilings? Love the big clocks…we have an empty space over our fireplace and that’s where it’s going. Is the large clock suitable to hang above TV ? I just adore oversized clocks! I feel it really adds something so homely to a room when decorating. Hi, Kylie! I just discovered your blog and love the wall clocks shown. I have a 6 1/2 foot wall between French doors leading to a front porch. There are two chairs on the wall with a tray table between them. I want to put a clock on the wall above the chairs but am hesitant to do so because I’m worried I’ll pick something either too small or too big. I wasn’t going to put anything else on that wall. What size would you recommend? I have a mirror over my fireplace and don’t want the two to compete with one another. Help! Thanks so much for your thoughts. I love clocks, especially all the Farmhouse ones that are everywhere now. Is it ok to hang one in the bathroom? It is 23 1/2 dia. You betcha, I don’t see a problem with that! I would love a wall clock in my front room! First home, on the smallish side 2100 sq. feet. Living room is nice and long, I have a Moroccan feel with the rug, pillows, etc. Any suggestions on a type of clock that would go well with that?